Oliver Perry Poulson was born to John and Hannah Poulson on December 17, 1821, a native of Loudoun County, Virginia. The family later moved to Holmes County, Ohio, as early settlers. There, Oliver Perry Poulson grew to a young man and, in the year of 1841, he ventured away from his family to join his brother-in-law, William Davenport. They moved to Henderson County, Illinois, and resided there until 1846 when, together, they traveled to the west coast, like many others in search of homes. Many more wagons joined them. Eight wagons quickly grew to forty. 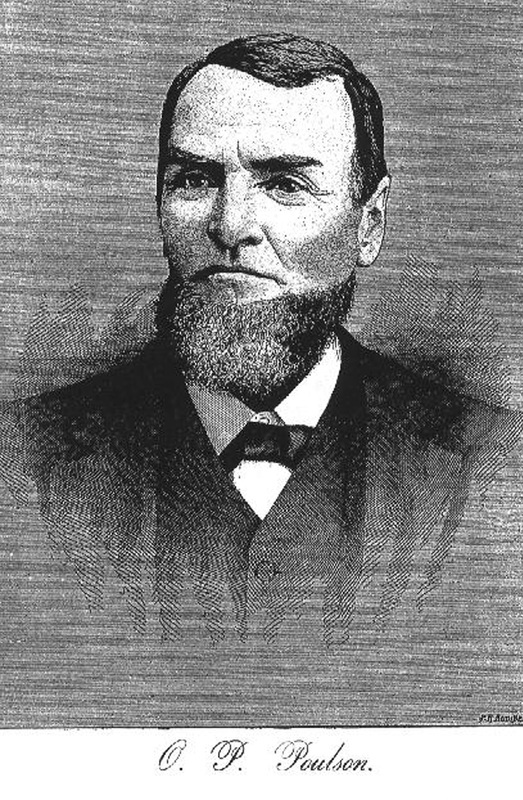 During the trip, Poulson was in the train commanded by Captain Donner of the later “Donner Party”. Poulson’s group, like others, increased the speed crossing the Sierras before winter set in. He escaped the possibility of becoming one of the deceased of the Donner Party. Before setting out on the expedition to the west coast in search of homes, Poulson stocked his wagon full of provisions that included food, water and supplies. Towards the end of the journey, other wagons were low on their provisions. Poulson, and other well equipped wagons, shared by handing out only essential rations. Finally after reaching Sutter’s Fort, all could eat healthy nourishing food. American River. Poulson could not sit still. He traveled to Coloma and returned to Sonoma with $2,600 - a small fortune then. Being an early pioneer in California, he was one of those who preceded the “Argonauts of '49” and made the way for them easier. In 1868, he moved near Middletown, where he farmed and raised stock on his 250 acres. Later, he purchased twenty acres of land in the Russian River area and moved to it. He planted prunes, plums, peaches and pears. Poulson married Harriet Armor Ritchey on February 28, 1847 in Russian River Township. Together they had twelve children: Amanda, Eliza ,Mary, Nettie, John, Caroline, Cynthia, Emily, Addie, William, Mattie and Angeline. Poulson was a Republican politically and a member of the Seventh Day Adventists. He died at age of 60 of an aneurism. He was buried at the St. Helena Cemetery on September 07, 1890.